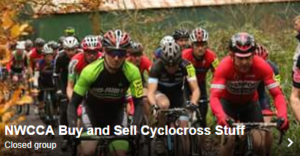 With an NWCCA race at Pignut Hill on the same day, it was left to the Youth riders to defend the honour of the North West in the Inter-Area Championships at Milton Keynes Bowl. The boys team consisted of Alex and Christian Braybrooke, Robert Rogers and Oliver Payton, with the girls team being made up of three National Trophy riders, Martha Gill, Jessica Wilkinson and Henrietta Colbourne. Entering the Bowl for a pre-race inspection was a real surprise for the team. This was going to be a tough one! The organisers had used every inch of the grassy amphitheatre-style arena to set out a challenging course consisting of repeated hills and off camber turns. Both boys and girls teams went off together in a mass start of 101 riders. A fast tarmac opening suited those with road experience, including Alex who got an excellent start. A tight uphill turning through bushes to enter the arena split the race with many riders being caught up in the bottleneck. Shouldering her bike, Jessica elbowed her way through the queueing boys to take an early lead in the girls race. Alex unfortunately took a tumble on one of the more challenging corners, with Christian taking the opportunity to recover the lead position within the team. After a slower start, Robert began to work his way progressively through the pack, followed closely by Oliver, riding a confident race. On the second lap Jessica was caught by East Midlands rider, Sarah Lomas, who used her hill climbing ability to take the lead and continue to pass riders. Not far behind, Martha and Henrietta were putting in the hard yards, engaged in close battles and demonstrating great stamina as competitors dropped off, as the repeated hills took their toll. 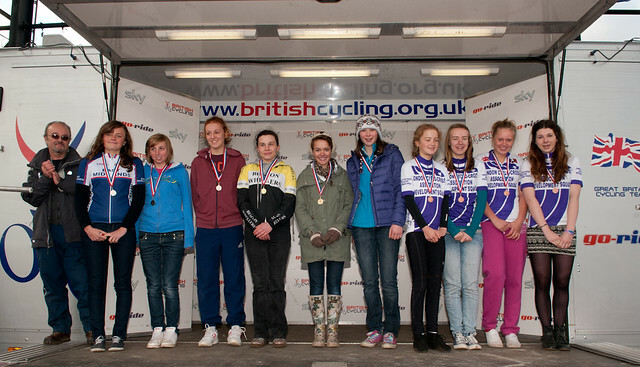 By the end of the race, Martha and Henrietta had both finished ahead of the second placed rider from the East Midlands girls team. However, with such a wide field, including both boys and girls, it was hard to know exactly where we had finished in the overall points tally. It would have to wait until the presentation. The boys were unlucky to not make the podium with Robert, Christian, Alex and Oliver finishing solidly in 20th, 22nd, 31st and 37th respectively from 101. The girls weren’t too hopeful as the results were read out at the prize presentation – in reverse order. …… Third place – London……… Second place – East Midlands……….. First Place – North West!